1.It comes with Blog title,Post Titles,Date of Publish,Excerpt from the post(optional). 2.The time delay between each Post Title show is 5 seconds. 3.It also comes with a border which can be turned off as well. 4.We can halt the rotation by hovering with mouse cursor over the post title till mouse moves off the item. 5.You can also customize this widget according to your needs that best suits your blogger template blog. 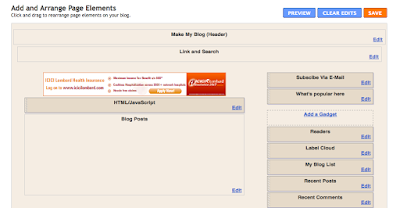 Now the Important Part is how to integrate it in your blogger template blog. Step One Log In to Blogger Account. Step Two From the Dashboard Click Layout link. Change "MYBLOG" to actual blog subdomain and "BLOG_TITLE" to actual title of your blog.Now Copy and paste the modified code in the HTML/Java Scipt gadget(Created in step three) and click save button on the gadget. Width:Look for the following section of code and change the width suitable to your blogger template. Border: If you do not want to show border then look for the following section of code and the border width to 0px. You can also change the fonts of the widget.To change the font-size of Post titles look for the following section of Code and change font-size suited for your blog. I have described some important customizations generally needed for bloggers.You can explore a number of other customizations for your blogger blog. Sorry for the inconvenience caused to all of you. As this post has been published couple of weeks therefore it might not be working on some platforms due to an upgrade in technology. Now I have updated the code and also checked if its working or not.I hope now the code will work fine. hey i had a problem with installation but i think i will do it now.